KANSAS CITY, KAN. ---- Very rarely do I write about myself here, but I wanted to announce that I recently finished writing an eBook. 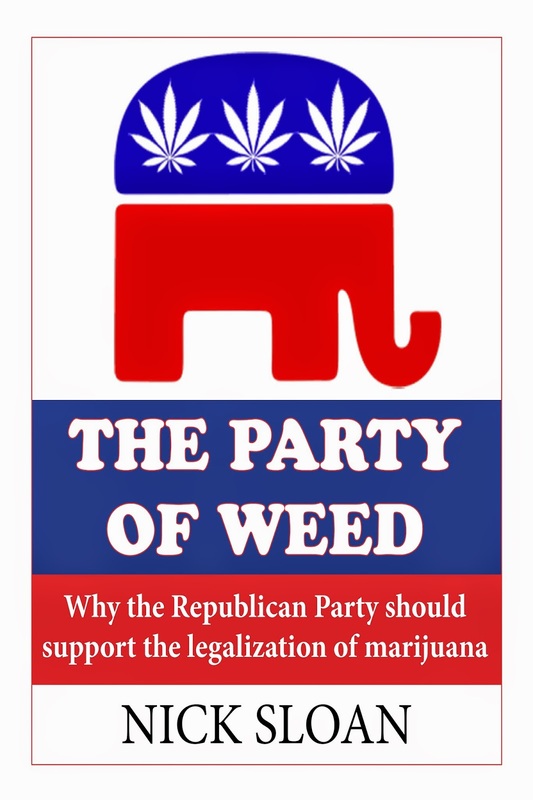 The eBook, named "The Party of Weed," is a short book aimed at Republicans on why they should support the legalization of marijuana. There's no criticism here or cheap partisan shots - I am simply stating the case on how marijuana legalization would fit in with the party's current platform. I started this project about three months ago and with medical marijuana being debated in the Kansas Legislature, I figured it might be wise to release it now. I aim my message towards conservatives and Republicans for a few reasons. First, a late-2014 Gallup poll indicated that just 31 percent of conservatives believe marijuana should be legalized in the United States. While a majority of independents and liberals support legalization, most conservatives and Republicans do not. And after November's elections, the Republicans are in charge of most state legislatures and now, the United States Congress. If legalization happens any time soon, Republicans will need to get on board. Second, I believe there's a strong conservative case to be made about marijuana legalization. The war on marijuana has greatly increased the size of government. Conservatives aim at reducing the size of government. Marijuana legalization has created thousands of jobs in Colorado and has generated millions of dollars in tax revenue and additional fees. Prohibition of marijuana has helped increase crime throughout the United States and dramatically increased the incarcerations rate, particularly in the black community. Entering 2015, the negative economic impact of prohibition is into the billions of dollars. In Colorado, marijuana has thrived in the free enterprise system we have in the United States. Colorado residents could receive a tax cut AND increased funding in education. That's very rare, but marijuana legalization has made it happen. Although I am a libertarian, I realize there is a conservative case to be made about legalization marijuana. In one chapter, I address the situation in Kansas. Kansas, which is facing a deep budget hole, could save millions of dollars if they released non-violent marijuana drug-offenders and legalized pot. I also address the potential health benefits of medical marijuana, along with comparing marijuana with alcohol and tobacco. The book is only around 75 pages. I do not believe in "adding fat" to writing simply to increase the length of it. It's a book you can knock out in two-to-three hours. That's why the price is only $3.99. Thank you for your support! Even though the book is aimed at Republicans, anyone interested in the marijuana issue should consider purchasing it. I used nearly 50 sources of research on this.